Admiral Henry Ariosto Wiley (31 January 1867 – 20 May 1943) was an officer in the United States Navy during the Spanish–American War, World War I and World War II. After various shore and fleet commands, he was appointed Admiral in 1927 and served as Commander-in-chief, United States Fleet, until his retirement in 1929 after over 40 years of service. 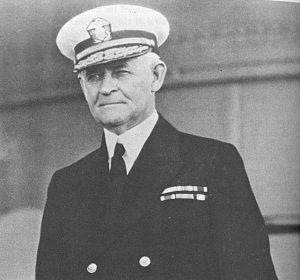 Admiral Wiley served in the years that followed as Chairman of the Maritime Commission and in other important government posts until being recalled to active duty in 1941. In the next year he headed the Navy Board of Production Awards. Admiral Wiley retired once more 2 January 1943 and died 20 May 1943 at Palm Beach, Florida. USS Henry A. Wiley was named for him. ROBERT WYLIE (or better known as “Bob Wylie, the wool buyer”), the subject of this sketch, is of Scotch-Irish descent. His ancestors were known as leaders in the reformation of the Church of Scotland, and several of them were banished from Scotland and Ireland for their adherence to the principles of the new Church. His grandfather, Robert Wylie, was born in County Antrim, Ireland, in 1743, and came to America with several of his half-brothers about 1761. They first stopped in the east, and further west, at Thompsontown, on the Juniata river, he married, about the close of war of the Revolution, Jane Thompson, daughter of John Thompson, and sister to Col. William Thompson and Capt. Isaac Thompson, of the Revolutionary army. About 1780, with his wife, he came west to Washington county, and took up a tract of 600 acres of land (the main body of which is now owned and occupied by the four sons of the late David McClay, of Canton township), and on this land he built a log house in which he lived for some years, or until about 1800, when he put up the stone house which still stands, and is the present dwelling of Samuel McClay. Through this farm was the main Indian trail from the west to the dwelling of the great Chief Catfish, whose cabin stood on the bank of Catfish creek, at the foot of what is now Main street in Washington. (A chief watering place was a spring on this farm, where the wandering Indian always stopped to quench his thirst). He built a trade mill and distillery, thus opening a market for the grain raised in the neighborhood; he was also largely interested in salting pork for many years; later he started a wagon train, hauling products east, principally to Baltimore. He was a member of the Associate Reformed Church, and for many years an elder in the church at North Buffalo. In the burying ground around this old church his and his wife’s remains lie at rest. Their family consisted of three sons Robert, William and John and five daughters Ann (Brownlee), Jane (Humphreys), Sarah (Hodgens), Elizabeth (Moore) and Mary (Crothers). Many of the descendants of his daughters reside in Washington county and eastern Ohio. John Wylie married and settled in Ohio, where he became a successful stock dealer and farmer; William and Robert remained at home until 1834, when William sold his interest in the home farm to Robert; later, Robert sold the farm to David McClay and Bros., and soon followed his old partner in business, John Garrett (they having been associated together for several years in a store at West Middletown), to Baltimore, Md., where he acquired a considerable fortune. He died in 1872, unmarried. William Wylie, father of Robert Wylie, Jr., was born on the old Wylie farm, September 25, 1800, and received a good education, having attended Washington College several terms. In 1829 he was married to Mary, daughter of James Clark, of Hopewell township, and after marriage he remained on the home farm four years, having in the meantime built a frame residence a short distance from the old stone house. In 1834, three years after the death of his father, he moved to the Razor Town farm of 210 acres, which he had purchased a year or two before. Razor Town, from which the farm took its name, was a village of twenty-six houses and cabins, with one good- sized tavern having a dozen rooms, and a blacksmith shop, race-course, etc. This point was known as a horse-trading post, and from the fact that many sharp deals were made there the place took the name of “Razor Town.” William, thinking that creditable neighbors could not dwell in such houses, immediately set about to remove them, and in a few years the little town passed out of existence. On the spot where the old tavern stood he put up a set of weigh scales, which continued in use until 1878; he built the present farm house, and occupied it until his death in 1877. His occupation was that of a farmer, and for many years he killed and salted about 1,000 hogs annually at his home. He was also a stock dealer (buying stock in West Virginia and Ohio), driving it east to Philadelphia and New York, and strange to say he never made but one trip over the mountains with his stock, as he trusted them to employees until his son Robert was old enough to take charge of them, which he did at a very early age. In partnership with his brother- in-law, David Clark, he owned and kept a general store for fifteen years in what is now known as the “Howe building” on Main street, Washington, between Chestnut and Beau streets. He hoped to make a store keeper of his son Robert, but the latter strongly objected to being tied down so closely to business. He sold the store in about 1849. He also dealt in wool, and in 1845 he built the frame warehouse on West Chestnut street, which is now occupied by R. Wylie & Sons, in the same business. William Wylie was a member of church for fifty years, first at North Buffalo and then at Washington, and was one of the organizers of the U. P. Church at Washington, of which he was a member. In politics he was originally a Whig, afterward a Republican. He was never an aspirant for office, but nevertheless was recognized as one of the best posted men of his time in matters political, and always took an active part in the issues of the day. His hospitality was widely known, and his table never wanted for guests. His rifle shooting was the one thing upon which he prided himself, and stories of putting three out of five bullets in a cap box (about two inches in diameter) with his old squirrel rifle, at one hundred yards distance, off-hand, are familiar ones to his grandsons and nephews. The children of William and Mary (Clark) Wylie were Robert; Jane (Beall), wife of John Stricker Beall, banker of Wellsburg, W. Va.; Mrs. Annie E. Thompson, living in Washington, widow of Rev. Joseph R. Thompson, late of the Associate Reformed Church; and James Clark, who died at the age of twenty years. ROBERT WYLIE, the subject proper of this narrative, was born August 25, 1830, on the old Wylie farm in Canton township, Washington Co., Penn. He attended the district schools, and later took an irregular course at Washington College. He was not a rugged boy, and could not stand close confinement at school, so he early took to the roads where he might breathe a more free air. At the age of thirteen years his father intrusted to his care a drove of cattle and sheep to be driven across the mountains and sold in Philadelphia, the money to be brought back by him in saddle-bags on horseback. He liked this business better than going to school or staying in the store, so he continued at same for some years, at first driving to Philadelphia and New York, later to Harrisburg. When the Pennsylvania Railroad was being finished to Pittsburgh, he early took advantage of this means of transport, being one of the first shippers on the road passing over the nine inclines through the Alleghany mountains. In 1861 he moved with his wife and family to a farm in Cumberland township, Greene Co., Penn., where they resided until 1865, when he purchased the Dr. Stevens farm in Canton township (340 acres), situated two miles west of Washington on the Taylorstown road, upon which he erected all the buildings which now stand upon it. He now resides there, surrounded by his children and grandchildren. With farming he combined the wool commission business, in which connection he is probably best known, his figure being a familiar one in his own and adjoining counties in fact, to the people within a radius of fifty miles of his home his is a well-known, welcome face. His two sons, William and James B., became associated with him in business some four years since, the firm name being Robert Wylie & Sons, and the amount of wool bought and handled by them runs well toward a million pounds annually, the bulk of it being bought by the senior member of the firm, who gives to this branch of the business the greater part of his time. He is now sixty-two years of age, but looks younger, and is yet in the prime of life. In his rides through the country he fears no kind of weather or roads, nor does the worst seem to affect his iron constitution. WILLIAM WYLIE, born November 10, 1859, in Canton township, Washington Co., Penn., up to the age of fourteen years attended the common schools of his district, and then went to Washington and Jefferson College, where he remained four years. Returning home he engaged in the wool business with his father, and at the age of nineteen entered the Iron City Business College at Pittsburgh, Penn., where he graduated. He then embarked in the wool and farm implement business with his father, which they carried on for three years, when his younger brother James B. entered the business with them. They then abandoned the farm implement branch of their business, and have since been engaged exclusively in the wool business, which they have greatly enlarged, having extended their operations over a half dozen of the adjoining counties. They do business under the firm name of R. Wylie & Sons, and they are among the heaviest wool dealers in western Pennsylvania, enjoying the confidence of the people far and wide, to which their proverbial fair dealing justly entitles them. On June 16, 1885, William Wylie was married to Mary W., daughter of Joseph C. Gist, of Brooke county, W. Va., and they have been blessed with two children: Lizzie B. born October 6, 1887, and Clara V. born November 21, 1891. After marriage Mr. Wylie settled on his farm in Canton township, two miles west of Washington, Penn., where he still lives. He is a member of the U. P. Church at Washington; and in politics is a Republican. Mrs. William Wylie was born August 27, 1861, in Brooke county, W. Va. Her father, J. C. Gist, was born March 16, 1820, in the same county. He was a large farmer and was engaged in the breeding and sale of fine sheep all his life. He was a Republican, and served one term in the West Virginia Legislature; was in the Senate in 1861, at the time of the war, one term. He was also talked of for governor of his State at one time, but for some reason best known to himself he did not run, although his friends assured him he would win. He died November 22, 1892. On August 10,1848, J. C. Gist married Elizabeth Culver, of Jefferson, Penn., born February 12, 1826, at Jefferson, Greene Co., Penn., daughter of Thomas Culver, a farmer. Mrs. William Wylie has three brothers and one sister living: Samuel C. Gist, J. W. Gist, and J. C. Gist, Jr., all living in Brooke county, W. Va., aud Mrs. John C. Roseborough, of Brownwood, Tex. Mrs. Wylie’s great uncle, Christerphor Gist, was a member of Gen. George Washington’s staff in the Revolutionary war. James Beall Wylie, second son of Robert and Elizabeth (Beall) Wylie, born September 24, 1862, married June 24, 1890, Helen Cornelia, daughter of William D. and Elizabeth (Williamson) Roseborough, of Sardis, Miss. William Roseborough was a cotton planter, as were his father and grandfather before him; they were formerly of South Carolina. Her grandfather lived in Chester, S. C., and was clerk of the courts for fifty-two years; his wife, Eleanor (Key), was a daughter of Martin and Nancy (Bibb) Key, of Albemarle county, Va.; her great-grandparents came from Ireland to South Carolina about the time of the Revolution, and their families were both of French Huguenot ancestry, who left France about the middle of the seventeenth century; her great- grandmother Roseborough’s maiden name was Gaston, and she was a daughter of William Gaston, of Cloughwate, Ireland, who was a grandson of the Duke of Orleans (the leader of the Huguenots, banished from France in 1642, some history says 1652), brother of Louis XIII and son of Henry IV, King of France and Navarre. J. B. and Helen R. Wylie have one child, a daughter, named Marion Marguerite Wylie, born May 14, 1891. Their home is in Canton township. Laura Virginia, the only daughter of Robert and Elizabeth (Beall) Wylie, was born October 7, 1867, and was married October 1, 1890, to Joseph C. Gist. Jr., son of Hon. J. C. Gist, of Brooke county, W. Va., where they now reside. They have one child, a son, born June 11, 1892, named for his grandfather, Robert Wylie. Beers, J. H. and Co., Commemorative Biographical Record of Washington County, Pennsylvania (Chicago: J. H. Beers & Co., 1893). David Wiley, a surveyor and Presbyterian minister, moved to Georgetown around 1800 to serve as principal of the Columbian Academy and teach natural philosophy, mathematics, geography, and Greek. 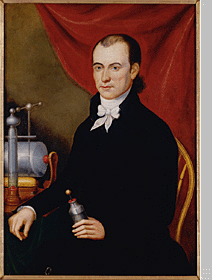 Advertisements for the academy mention an “Electrical Machine”; this may be the instrument depicted in this portrait by Charles Peale Polk. Polk shared Wiley’s interest in science, for he was Charles Willson Peale’s nephew and had grown up in his household, where he absorbed Peale’s interest in natural history, and also learned to paint. Polk’s rendering of the electrical machine is puzzling. It is not likely that he misunderstood its use or construction, yet it is unlike more standard machines of this type. The cushion, which generates a charge by turning against the glass, is on the bottom rather than the side of the cylinder. The metal spikes just visible at the top of the cylinder, which collect the charge (only positive in this machine), should also be on the side. Other inconsistencies in the machine, all parts of which sit on a wooden base atop the table, may indicate that it was an unusual one, perhaps designed by Wiley. He poses proudly beside it, holding a Leyden jar, which would have been used to store an electric charge for future use. 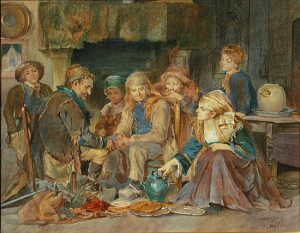 WYLIE, Robert, artist, born in the Isle of Man in 1839; died in Brittany, France, 4 February, 1877. He was brought to the United States in childhood, and first studied art at the Pennsylvania academy. In 1863 he went to France, and in 1872 he received a second-class medal at the Paris salon. His professional career was in France, and his pictures deal mostly with the life of the Breton peasants. His “Death of a Vendean Chief” (1876-‘7) is in the Metropolitan museum, New York. Andrew Wiley, son of William and Mary Wiley, was born in the State of Virginia, in the year 1815. He was reared to farm-life, and owing to the absence of educational facilities, was deprived of the opportunity of attending school during his childhood. His education was acquired, principally, in later life, by individual effort. He adopted, in mature years, the occupation in which he is engaged during childhood, and adding to this the trades of cooper and carpenter. He was united in marriage with Miss Harriet Brierly, who bore him two sons – Caleb Warren and Sylvester B. But the sacred tie was subsequently severed by the decease of the wife and mother, and her gentle influence forever from earth. In 1846, he came to Jefferson Township, Huntington Co., Ind., and in 1857, was united in marriage with Jane Wright of Darke County, Ohio. 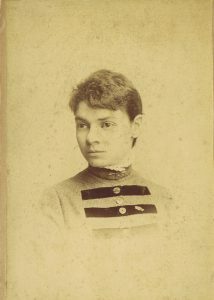 She is the daughter of Thomas and Matilda Fall Wright. This second union was blessed by six children, named, respectively, Lotitia, Norman, William, Charles, Sarah E. and Sadie. The father died January 11, 1873. During his life, he was an enterprising farmer, and his labors were crowned with financial success. He was universally respected by his neighbors and acquaintances, and was often solicited to accept the nomination of his party for political offices, but only yielded once to their request. In 1862, he was the candidate of the Democratic party for the office of County Commissioner, to which office he was elected, and during his term of service in that capacity, he was instrumental in bringing about many projects which resulted in the general good of the county. He was a cordial supporter of the Bluffton, Warren & Frankfort Narrow-Gauge Railroad, and contributed liberally toward the success of that enterprise. He was also permanently connected with the Huntington & Warren Gravel-road. He was a supporter of the Calvinistic doctrine, and throughout his life, was a devout Christian. He had but few enemies, if any and his death was lamented throughout the community. Source Information: American Biographical Library . Salt Lake City, UT: Ancestry Incorporated, 1996. Wiley, Aldrich (Mass). Corporal and Sergeant of Sergeant’s Massachusetts Regiment, May to December, 1775; Ensign 16th Continental Infantry, 1st January to 31st December, 1776; 1st Lieutenant 8th Massachusetts, 1st January, 1777; killed at Stillwater, 7th October, 1777. [p.592] Wiley, Aquilla (Pa). Captain York County, Pa., Militia in 1777. Wiley, John (N. Y.). Captain 1st New York, 24th February to ? November,1776. Wiley, John (Pa). 1st Lieutenant Pennsylvania State Regiment, 18th April, 1777; regiment designated 13th Pennsylvania, 12th November, 1777; resigned 25th January, 1778. Wiley, Robert (Mass). Ensign 8th Massachusetts, 1st January, 1777; wounded at Bemus’ Heights, 19th September, 1777; resigned 14th August, 1778. Wiley, Robert (Pa). Captain of Flower’s Artillery Artificer Regiment,1779, and served to close of war. Willey, John (Conn). Captain in Lexington Alarm, April, 1775; Captain Lieutenant 2d Connecticut, 1st May to 17th December, 1775; Captain of Wadsworth’s Connecticut State Regiment, June to December, 1776. Wylie, Thomas (Pa). Captain Lieutenant of Flower’s Artillery Artificer Regiment, 17th February, 1777; Captain, 1st February, 1778, and served to close of war. Wylley, Thomas (Ga). Was an Ensign 2d Georgia in May, 1778; Captain and Deputy Quartermaster General of Georgia troops, 1779–1781. Wyllys, John Plasgrave (Conn). Adjutant of Wolcott’s Connecticut State Regiment, January, 1776; Brigade-Major to General Wadsworth, 7th August, 1776; taken prisoner 15th September, 1776, on the retreat from New York; exchanged 20th December, 1776; Captain of Webb’s Additional Continental Regiment, 1st January, 1777; Major, 10th October, 1778; transferred to 3d Connecticut, 1st January, 1781; transferred to 1st Connecticut, 1st January, 1783; retained in Swift’s Connecticut Regiment, June, 1783, and served to 25th December, 1783; Major United States Infantry Regiment, 9th June, 1785; Major 1st Infantry United States Army, 29th September, 1789; killed 22d October, 1790, in action with Indians on the Miami, Ohio. by Rev. C. A. Salmond, M.A., Edinburgh. The Free Church Monthly , August 1, 1890. In the lamented removal of Dr. Wylie, the leading representative of a Church and also of a cause has been taken from us. Surviving as he did the younger M’Crie, he was the most notable living representative, for years past, of the majority of the Original Secession body, who joined the Free Church in 1852. And, as everybody knows, he has long been the leading Protestant authority, not in Scotland only, but in English-speaking Christendom, on all questions relating to the Romish controversy. Born at Kirriemuir on 9th August 1808, he had nearly completed his eighty-second year when he died, on 1st May of the present year; but such was his vitality even as an octogenarian, that at the time of his death he had in contemplation an amount of literary work, the thought of which would have burdened many a younger man. He hoped, for one thing, to finish his “History of the Scottish Nation,” by adding other three volumes to the third lately issued; and he had expressed his willingness, when Mr. Cusin died, to undertake if called upon– a task happily committed since to his friend Mr. M’Crie of Ayr– the preparation of the next series of the Cunningham Lectures. His education was begun in the parish school of his native place. Then he passed to Marischal College, Aberdeen, for three years, completing his Arts course by a session at St. Andrews, under Dr. Thomas Chalmers. In 1827 he entered the O. S. Divinity Hall in Edinburgh, and there came under the influence of a man who impressed him even more than Chalmers had done– Dr. Thomas M’Crie, the biographer of Knox. He was admitted to intimate fellowship by M’Crie, and he carried the memory of his friend and teacher with him as a life-long inspiration. His license took place on 1st December 1829, and he was ordained at Dollar on 20th April 1831. His pastoral sphere there was a very limited one, but its duties were faithfully and cheerfully discharged for the next fifteen years, during which period, however, his pen had found for him a much wider constituency. To the time of the Dollar ministry belong his “Modern Judea,” “Scenes from the Bible,” and other works, which were most favourably received, and ran into numerous additions. In 1846, Mr. Wylie had an important offer from Hugh Miller, which, by the advice of the younger M’Crie and with the eager approval of Dr. Candlish, he felt it his duty to accept– the joint-editorship, namely, of The Witness. This involved his transference to Edinburgh, on whose streets, for the succeeding forty-four years of incessant literary activity, he has been one of the most familiar figures. His association with Hugh Miller on The Witness was a very happy one; and some eight hundred of the leading articles in that almost epoch-making journal were from Mr. Wylie’s hand. His exuberant energy found outlet the while in the publication of several separate volumes, the most notable of which appeared in 1851, and was entitled “The Papacy: its History, Dogmas, Genius, and Prospects.” This treatise gained for him, by the unanimous award of Drs. Wardlaw, Cunningham, and Eadie, the Evangelical Alliance prize of a hundred guineas. It also won for him a European reputation,– to which the savage attacks of Romish critics, at home and on the Continent, brought added lustre,– and it helped to give direction to his future life. In 1852, as already mentioned, Mr. Wylie joined the Free Church of Scotland; and in the following year he became editor of the Free Church Record– a post which he held for the next eight years. The degree of LL.D. was conferred upon him by Aberdeen University in 1856. Of his separate literary ventures at this time, one was a competitive essay on “The Gospel Ministry: the Duty and Privilege of Supporting It.” He secured by it the prize of £150; and in this connection Dr. Joseph Parker, who obtained proximos honores, writes: “On procuring Dr. Wylie’s essay and reading it, I said, ‘This should have won both the prizes: it is infinitely the best. '” The “Pilgrimage from the Alps to the Tiber,” “The Waldenses,” and “The Great Exodus,” also found many readers. In 1860, mainly through the instrumentality of Dr. Begg, the Protestant Institute was established; and Dr. Wylie, by acclamation, was invited to be the lecturer. The appointment in his case was for life; and though the subject of Popery is not in itself attractive, it is true– and it is much to say– that for thirty successive years Dr. Wylie’s treatment of it has continued to be a living influence in our land. In him the Churches had no mere holder of an office, but a man with a mission, who, while centering his energies on the functions of his chair, was ready to devote his life in every possible way to the exposure of Papal errors and the clear and fervid counter exposition of the principles of the Reformation. If the members of even his first class felt that they were sitting at the feet of one who was a past-master in his subject, the successive relays of students who, to the number of about two thousand, went through his classes, had equal reason to know that in their teacher they had one not only familiar with Popish theory, but keenly awake to Popish practice in all its contemporary developments. Besides holding his classes, Dr. Wylie addressed countless meetings in his time throughout the country. His “delivery,” it must be said, contrasted unfavourably with the grace of his written style; but he rose on occasions to a genuine eloquence which fairly carried his audience along with him. This was notably the case once and again in Exeter Hall, where his appearance was latterly hailed with the utmost enthusiasm; and in many parts of England the announcement of Dr. Wylie’s name would draw a large audience together at any time. This was partly to be accounted for by the greater urgency of the Romish question in England. It was partly, no doubt, also due to the great circulation of his writings in the sister country, where his magnum opus, for example– “The History of Protestantism,” 3 vols., 2,000 pp., 1874-77– has sold in scores of thousands. We cannot enter further here into the details of his busy life. It was a life of great simplicity both in purpose and in habit. Spent mostly at the desk, or rather at the desk and mantlepiece on which a great part of his writing was done, it was varied by two regular daily “constitutionals,” at daybreak and in the afternoon, when he was at home, and by an occasional excursion to one or other of the historic lands of Europe, in the intervals of his class work. The day was ordinarily crowned by an hour or two of cheerful converse by the hearth. Those favoured with his intimate friendship will bear the writer out in saying, as he has already done elsewhere, that to be with Dr. Wylie at such times, and to listen to his rich and sparkling conversation, on whatever subject might come up, meant both education and enjoyment. Men spoke of him sometimes as a “fanatic;” but if his utterances on the Papacy were strong, his detestation of the system was equalled by his tenderness for its unhappy votaries. To virile strength he united a woman’s sensibility. It was a profound mistake to fancy in him an acrid, self-assertive, one-idead controversialist. He was one of the best informed, most genial, and sympatric of men, and his deep unaffected humility was one of his greatest charms. You could not be long with him without perceiving in him a lover of Christ and of all good men, and his mellow unostentatious piety gave an unmistakable savour to all his life.